The Exfoliating Konjac Loofah Body Sponge combines the goodness of Konjac plant with the power of the loofah, for an incredible deep cleansing and exfoliating experience. Konjac is natures enriching, powerful effective answer to premium skin cleansing and the loofah plant is an exfoliating king. Kinder than a loofah but tougher than other Konjac sponges, the konjac loofah offers great results on skin that requires a deeper exfoliation. 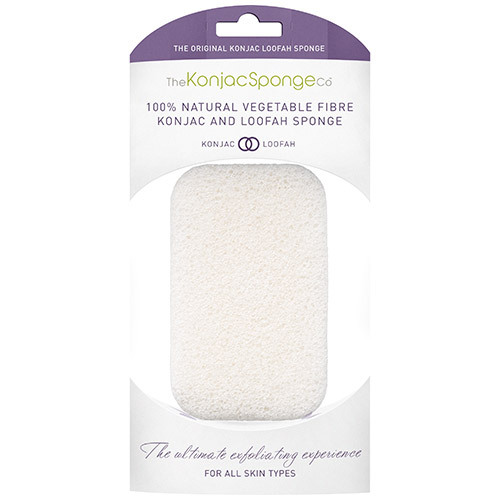 Ergonomically designed with 6 waves, the Konjac Loofah Bath Sponge is approximately 13.5 cm wide, perfect for use in the shower or bath. The Exfoliating Konjac Loofah Body Sponge is additive free, helps balance pH levels and is suitable for sensitive skin leaving the skin feeling radiant and rejuvenated. 100% Natural Konjac Fibre and Loofah. Below are reviews of The Konjac Sponge Co Exfoliating Loofah Body Sponge by bodykind customers. If you have tried this product we'd love to hear what you think so please leave a review. The best Konjac sponge ever! I use this all over in the bath/shower and lightly on my face. Makes your skin glow. I have just ordered another!